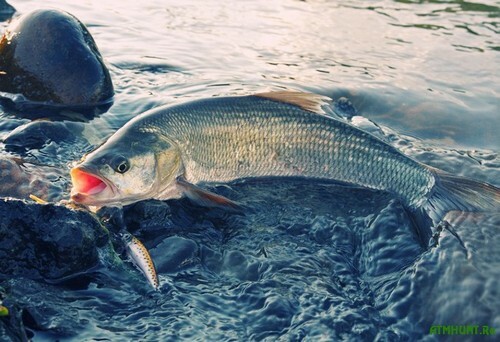 In places frequented by anglers, it is not always bite on spinning bait, which would have you not picked up. The use of correctly fitted restraints, the boat can make fishing more predictable. Importantly, baited the hook, the bait moved in the water course and located away from the hull of the boat. Also, the position of the angler on the Bank or any hydraulic structure must be invisible. Chub on big rivers closer to the fall usually gathers in large flocks. It’s easier for him to arrange a battue hunting for bleak and other horse-fish. Flock to find jamb detail, obkladyvaet it from all sides, and if she was at the bottom or in the water, then sticks it to the surface. Then the asps are beginning to turn off uplotneniya cant its powerful tails and eat fish. Feast river pirates are very impressive! Medium rivers such as the Oka or Kama, catching fish for the “pot” is sometimes accessible from the shore, but still on average, especially on large rivers often without boats can not do. Search ASP is associated with significant movements in the pond and vysmatrivaya gulls and breakers on the water. This would be the best boat or a boat with not very noisy motor and binoculars. A dense swirl of gulls over the water suggests that you find “ASP”, “pot”, which often has an elongated shape. Its area can vary greatly and depends on the size of the shoal of forage fish. At the approach to the “pot” the boat engine should be turned off for 150-200 m from the location of the fish, and then paddle down the stream or get on the oars. Now you should carefully observe. Knowing where the more concentrated the Chub, unfold the boat against the current and drop the bow anchor, so that then, pitting the rope down below and be on the side of the “pot” (of course, we must have a large supply of rope). Choosing a vending location, it is necessary to pull the second anchor to the boat shook on the course. It is impossible to approach “the pot” is closer to 70 m, otherwise the flock, afraid, depart. The boat, baited with live bait, allowed across the current, avoiding the battleground of ASP (rear). While caught in the leashes attached to the main fishing line at a distance of not less than 5-8 ILO of the boat, otherwise the latter may scare the fish with its impressive views. Leashes must be with a diameter of 0.3-0.35 mm, single hooks, No. 3-6, with the long forend. To attract the attention of the fish, the bait should occasionally lifting above the water. For this fishing technique is more suitable for a model boat “catamaran” — he is less visible. There are design korablikov, including mast, which allowed downstream from the boat. They should not be too massive so as not to cause suspicion of such a careful predator, as ASP. This is especially important if you want to stop the boat at promising points. In this case, the housing will push the flow, and an unnatural position of the object in the water will alert the fish. In the design of the mast of the boat used two versions of driver snap. First, when the leashes are attached to the fishing line in front of the boat. The second is when the leash is coming from the hull of the boat. In the first case, the leads should be placed as far as possible from the hull of the boat. In the second case, use a long, not less than 5 m leash is additionally equipped with horizontal and inconspicuous on the water float. During the descent of the boat into the water from the boat using the course, unfold a long leash so that he baited with the fry swam right in front of the boat. To do this, a tension fishing line slightly slow down the speed. If the boat is ahead of the movement of additional leash, this will lead to the entanglement of the rigging. All leaders are equipped with Berlusconi that prevents twisting of the line. As bait it is better to take large bleak or small roach. The bait should be placed close to the surface of the water. – His upper palate, closer to the solid part of the head, otherwise the hook will sit loosely. The bite of the ASP sharp. He usually grabs the bait immediately. When pulling the boat Chub violently resisting, so the hooks, vertucci and karabinchika for snap it is advisable to purchase from well-known manufacturers. When fishing for ASP on the boat you can also use artificial lures — the gcca, vibrohvosta, twisters. Especially artificial bait performed well when fishing boat on the Lower Volga. The gcca will suit the white-black or white-green; quality gcca is made of goat hair. It needs tee No. 8-13. On medium and small rivers, the boat is well caught jereski small, about 1 kg. They are a good peck on a variety of flying insects: dragonflies, butterflies that emerge from aquatic larvae of a type of cuttlefish, Kazar, caddis, mayflies, etc. One of the best baits for small fish is the gadfly. Sometimes that attachment was greater on the water, you should wear the hook at once two, but so that the insects continued to go to work the wings. Any natural fluctuations in the water attract the attention of a predator. Small butterflies also need to put on the hook for a few pieces. In small streams, UPA, zushi, Ugra, Shosha can be used successfully drifting downstream a stealth boat. Usually this fishing chassis. You’re going downstream, by selecting the Bank of the river, from which it is more convenient to pull the boat on the water. For the location of the fisherman fit any protruding toes or just a regular Bank with a convenient step near the water, which is a powerful striker jet which is suitable for releasing the boat. Of course, plays a big role in promising a place to dwell ASP. Often the ASP alone or in small flocks kept in the vicinity of sand bars, Islands of vegetation, in close proximity to habitat of whitebait in the shallows. There and have to pull the boat. It is most convenient to fish from bridges, piers that allow us to tackle the main jet. On the tributaries of the Oka, there are many old dilapidated bridges with the influx of top of garbage piles. In the aisles between the debris creates a powerful jet, which can hold Chub. Here and to send the tooling on the boat. Sometimes ASP, sabrefish, like, beats the fry on the edge of the shallow sand spits, where it can be washed away the sand, snags. In places like to remain bleak and verkhovka — here they find shelter from predators. The boat should be held, focusing on skidyvayte over the surface of the fish. When fishing single mothers asps should remember that they have always kept discreetly in the shadows, somewhere under the cliff, at the edge and near shallow water where the fry are going and where to jump out suddenly, catching fish off guard. Especially large Chub likes instantly break into a lagoon or other limited areas where the fry are unable to quickly go deep. In the lower reaches of the Volga, Akhtuba, this fish often hunts on the coastal trenches. Here ASP is popping up from the depths, anticipating, rush to the bleak. Often large fish choose between lowering the sandy terraces, in shallow water and at depth. But the depth of them to hunt harder. When you start the boat you should try to do the wiring so impaled on the hook, the bait was from the depth to the ground. Often Chub hunting for extremities sandy peninsulas and spits, which often immediately is open at depth. His hunting route is always along the cliff. In the lower reaches of many rivers good places to catch fish can be half-drowned bushes, which are often under the wooded steep banks. But, as a rule, kept small fish and in small groups, no more than 5-7 individuals. Usually the fish can catch from under the branches. Therefore, it is more efficient to use snap leash with end coming from the boat. However, this method of fishing can be fraught with claws, which resulted in the pack usually goes.